Editor’s note: This is the first in a 6-part series examining where the collector car hobby is headed in the next decade and beyond. Mark Gessler is president of the Historic Vehicle Association and National Historic Vehicle Register, a public/private partnership with the U.S. Department of the Interior and Library of Congress to document and preserve America’s automotive heritage. He also is the North American Ambassador to FIVA, the international body focused on vintage vehicles. He was the founder of Scuderia Sports Zagato and has three overall victories in the Mille Miglia since 2010. According to his mother, his first word was Volkswagen. Being asked to predict the future is a near hundred percent opportunity to be wrong. As a rule, we tend to underestimate change, but here are six trends to watch. We applaud brands that take history seriously. Land Rover has taken some unique steps buying the first series Range Rovers and restoring them in-house for sale as “restored by Land Rover.” This has since spilled over into Jaguar with the E-Type and even one with electric power that made its debut at the Royal Wedding. These kinds of activities will not make big profits but play a part in brand management and ultimately the market for the new cars. BMW, Ferrari and Mercedes-Benz also have client-facing heritage programs. Will others follow? For more than 50 years, car clubs have been the mainstay of the hobby. It was how we connected with other owners. But over the last decade or so clubs have been on the decline. While not a replacement, Cars and Coffee events have filled a niche as a pure cup of fun on a Saturday or Sunday morning. They are free-form, eclectic and Instagram candy. What’s next on this trend-line: bigger, more, or something completely new? Most urban centers in Europe have increasingly stringent restrictions on cars in the city. The reason is emissions. We are not just speaking about large cities but about some small villages as well. Historic cars are viewed as smokers to be ever more regulated. This trend will continue and may gain momentum. We’re lucky here in America, but for how long? Ask a young person to a car show and ask them honestly what they think. Us seasoned collectors with a few years (or decades) under our belts might not like what we hear. Car shows are boring! Why? The cars just sit there in a parking lot or on a golf course. Statues – no movement, no action, no fun. Lots of people being judgy – why? It would be near criminal just a few years ago to be seen in an old car that did not shine like the day it was born. It was as if we had a federal law against patina. Today the last Porsche 356 that has not been restored gets more love than its restored siblings. Signs of use, long-term care and neglect are real stories. This trend is even more alive in newer classics. Sports cars from the ‘90s for instance should have original paint and interiors to be cherished by new owners. Restorers are now being asked to help manage a car’s preservation not just strip it and make it new again. In 2014 we launched an automotive public history project in the middle of the National Mall in Washington, D.C .– the world’s largest concentration of museum visitors. 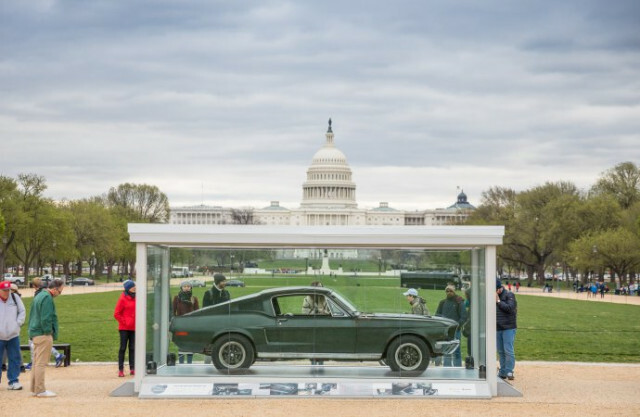 In 2018 our glass cube featured the Bullitt Mustang, Ferris Bueller’s Ferrari, the first Chrysler Minivan, the 15 Millionth Model T and a WWI Cadillac that served in France. During the four weeks in April we estimate that the exhibit attracted 500,000 visitors. They were young and old and mostly not car guys.